Burlington: Need help keeping warm or cooling down? From Halton Hills and Georgetown to Waterdown and all around Burlington, when homeowners want to feel comfortable in their homes, they know the Reliance™ team in Burlington offers first-rate expertise and customers service, every time. Reliance call support is there when you need it, 24/7, whenever you have questions or issues with your heating, cooling, plumbing and more. Our installers and technicians are licensed and trained continually so the service and installation you receive is always done right. You can also rest easy thanks to our range of protection plans and guarantees, which ensure that you're always taken care of. Plus, because we're used to servicing growing communities, we're experienced at dealing with a lot of newer homes' builder grade heating and cooling equipment that may not be of the highest quality. We can help. And if you have a new home that didn't come with a furnace or an air conditioner, ask us about our wide selection of brand names including our own SmartAir™ equipment. Whatever your needs, our goal is straightforward – to be your first choice for home comfort! Hi, I'm Lawrence. As a member of the Reliance Home Comfort team, I believe in providing world class products and services that enhance the comfort of our Burlington and surrounding area customers’ homes, workplace and community. Provide leadership and support consistent with our shared vision to provide best in class customer experience, products & service. Help customers make the most informed decisions by providing industry-leading training and resources to our Home Comfort Advisors. Understand the needs of our customers and provide innovative solutions that are efficient, economic and specific to their home comfort needs. Maintain long-term partnerships with our valued customers and team members by being actively involved in the sales process throughout our community. Be accessible to our customers and respond with a high sense of urgency while paying very close attention to detail. Ensure that our employees are safe and have a consistent heightened awareness around safety by reinforcing best practices and safety policies. If you ever have any questions, concerns or compliments about our team, please let me know! My name is Mike and I've lived in the Burlington area for 4 years – joining Reliance in 2016. 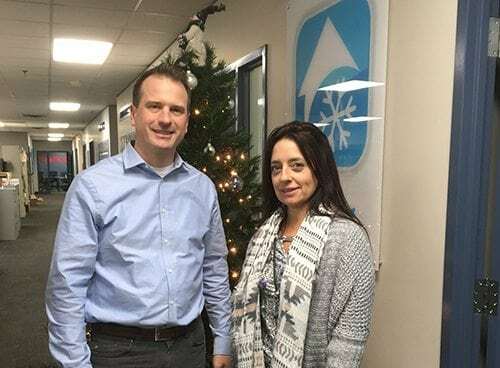 Reliance has been a perfect fit for me as it allows me to draw from my experience in previous industrial sales roles and my communication skills, which I refined in my previous career as a middle school Phys. Ed. teacher. As a husband and a father of two young sons I can fully appreciate the challenging decisions families today face when dealing with modern home comfort. My experience in the industry and awareness of my customers' needs helps me to provide the best solutions possible. When not at work, I enjoy spending time with family. I can also be found at ball fields, hockey rinks, and gyms throughout the Burlington area. Hi there. My name is Scott and I've been with Reliance for 7 years. As they say at here "We are not comfortable until you are" and I really take that to heart every day. I'm married to my beautiful wife Eva and have two children in university. We've lived happily in the Burlington area for 25 years. In our spare time, we love to travel. Hello. My name is Vince and I'm new to Reliance. While I've been here only a year, it's great working here and helping families meet their needs and maintain their budget. My fantastic wife and I have been married for 18 years and we have three wonderful children. We love living in Burlington – the waterfront parks and the drive up Lakeshore Boulevard – it's a relaxing way of life. When I'm not working, I'm involved with my kids' school and extracurricular activities and, when I have the time, love to visit Café Demetre for dessert! My name is Daniel and I've worked for Reliance for over six years – starting out as a gas technician and HVAC installer. 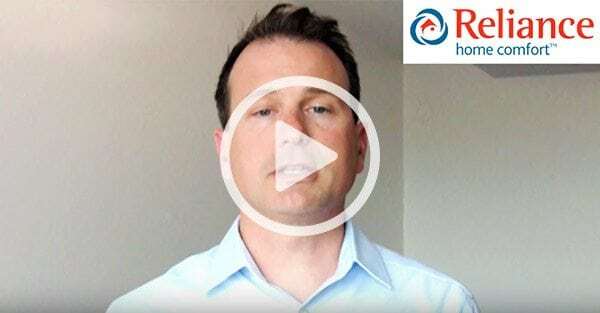 After a stint selling real estate, I found my way back to Reliance in 2016 as a Home Comfort Advisor. I'm glad to be back and happy to be providing residents with the right home comfort solutions for their homes. Whether you're looking for cool air on a hot day or warm air on winter night, I'm can help you find exactly what you're looking for. When I'm not working, I love to take my family to the waterfront and splash pad/skating rink at Spencer Smith Park. I also love playing guitar, which I've done for over 20 years. Contact me anytime – if you're looking for someone you can trust, I'll provide the service you need! Greetings. I'm Daniel and I've been working for Reliance for three years. As a Home Comfort Advisor, my #1 goal is to provide you with an exceptional experience and offer you the best in-home advice. Married with two beautiful children, we've lived in Georgetown for seven years. When I'm not working, we enjoy flying kits, heading out to the Rib Fest and volunteering with the food bank. If I can help you with your heating or cooling needs, please don't hesitate to give me a ring. We love Burlington and our team couldn't be happier to be a part of it – helping you stay comfortable and working with you to build a better community. Here are a few of the ways we're making Burlington better. Reliance team members take part in various initiatives in support of United Way, including volunteering for their Day of Caring campaigns. In 2016, our team showed its support and volunteered at a local soup kitchen and were involved in food preparation and stocking shelves. 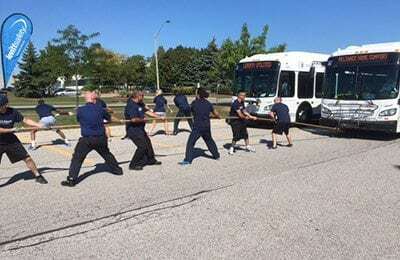 Our team exhibited an unparalleled display of power and prestige as eight of us pulled a full-size city bus to almost victory (third place – or rose gold) at the Oakville United Way Bus Pull! Our team walked to raise funds for MS research – over $4,000 this year supporting our team members. 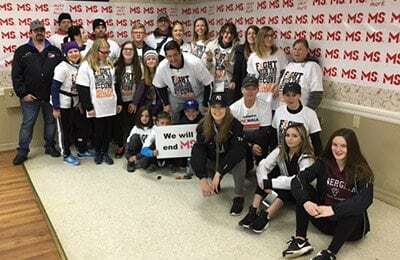 The Niagara chapter of the MS society raised over $68,000 as a whole! 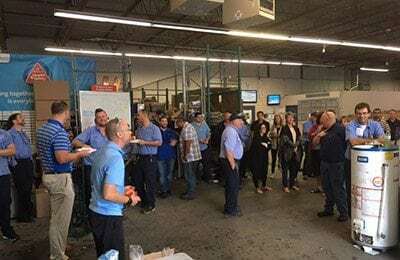 Through our annual BBQ in support of United Way, our team donates via payroll deductions and makes regular small contributions that have a huge impact. Reliance matches every dollar members of our team donate – doubling the impact. One in three families in our communities benefit from the agencies supported by the United way so we come together to fundraise and give generously! For the holidays, we partner with local community organizations to help make the season a little brighter for those in need in our communities. 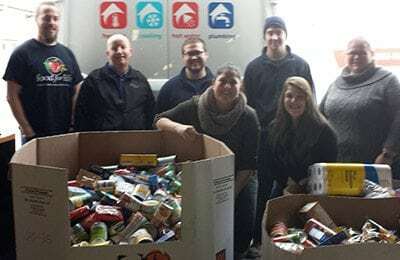 We’ve partnered with United Way and Food for Life and through the contributions and generosity of our team members, were able to deliver a truck-load of non-perishable food donations. Food for life is a great organization that works with other agencies to ensure that food gets into the hands of those in our communities that need it most. We also contributed an additional $2,900 to the Hamilton Urban Core Community Health Centre. This organization specializes in supporting the homeless, struggling families and working to get youth off the streets of Hamilton. We had the privilege of meeting Sherri, from the Hamilton Urban Core Community Health Centre and she shared that these funds could not have come at a better time. The area of Hamilton she operates in has the highest poverty level in all of Ontario. "Tony was a professional throughout the entire process from both a business and personal perspective. Very detail oriented and able to answer all questions with additional information. Provided options that were specific to our needs. Was very personable and consultative. Would recommend him specifically to all prospective clients. A huge thanks for making this a very positive experience!" "My reliance experience was great. He was on time, he called before he came, he gave great advice and fixed my problem in no time." "Our experience was very positive from start to finish. Tony, the adviser, spent hours in our home ensuring we were happy and everything was well explained. The installers, Bill & Wes, worked very efficiently and were very cooperative. Everything was explained well, after installation was complete, and everything was left very clean. All in all, easy people to deal with. " "Excellent service. I would highly recommend this company. Sara was a pleasure to deal with, I can't say enough. If you're looking for a furnace or air conditioning,this is the place to call. "